Paul Walker contemplates his best light. 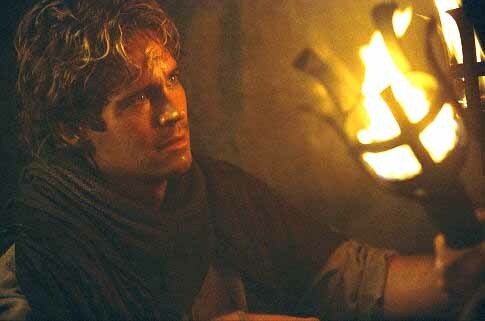 A group of archeologists (including Gerard Butler, Frances O'Connor, Ethan Embry, and Rossif Sutherland) have made an amazing discovery at one of their dig sites: evidence that their professor (a fun Billy Connelly) is stuck back in the year 1357 and needs help to get home. His son, Chris (Paul Walker, where does one begin with this lousy actor? ), demands answers, and gets them when representatives of a secret scientific research team usher him and his fellow archeologists to a remote base. It seems there has been an accidental "worm hole" opened during research for a "human fax machine," and the professor got stuck where he didn't belong. Chris and the gang are recruited to head back in time with a company man (Neal McDonough, "Boomtown") and retrieve the professor before he's lost to history forever. What "Timeline" (IMDb listing) amounts to is a respected and trustworthy director falling prey to vile casting choices and unconquerably detailed source material. The film is one step above full out disaster, but who's to blame? Director Richard Donner is one of most reliable talents in the industry, effortlessly guiding picture after picture to safe haven. From the "Lethal Weapon" series, to "Superman," to another medieval story, the cult hit "Ladyhawke," Donner is a pro and knows how to direct a film cleanly. However, "Timeline" might have been a bad idea from the start. Taken from Michael Crichton's bestseller, this is no easy adaptation. Where Crichton had the benefit of hundreds of pages to explain just what in God's name this plot is about, the film gives itself under two hours to tell the story. That isn't nearly enough time to scratch the time travel surface, much less integrate an audience into the complex and expansive narrative of the film. The story is something about a "wormhole" and the need to retrieve a professor from doom, and that's pretty much all we get. The film tries, with a clearly reshot scene (the cast is in awful wigs, and the cinematography brightens suddenly), to explain the the "time travel" reasoning, but it's futile. Donner knows it, and keeps the scientific explanations to a blurry minimum, concentrating more on getting the action and romance in motion. Another pitfall of Donner's film is his cast. With Paul Walker, Frances O'Connor ("A.I. "), and Gerard Butler ("Dracula 2000") as the three leads, all hope is lost. I haven't seen a bad actor lineup like this in a long time, and the cast makes good on its promise to ruin the film with screeching, ferocious overacting and the inability to improvise their way effectively through a scene. The cast, who seem to find that yelling over each other must equal good acting in some psychotic way, bury most of the crucial expository dialog. It must be stated again that Paul Walker cannot act, and faced with the prospect of watching him having to anchor this film is disappointing when real talents like Lambert Wilson (the Merovingian in the "Matrix" sequels), Billy Connolly, and Anna Friel (as a French queen) are all left with thankless supporting parts. Walker's dull surfer dude monotone ruins yet another film. The major set piece of "Timeline" is the big climactic battle between the French and English armies, which employs flaming catapults, castles under siege, and damsels in distress. Donner is clearly in his element with this stuff, and anything to get the actors to stop talking is a welcome sight. The other side of the story, where actor Ethan Embry has to out-ham the evil industrialist David Thewlis for control of the "fax machine," is equally as tedious as the medieval section. I really wanted to enjoy "Timeline" for what it truly is deep down in its black Crichton heart: a big, dumb action fantasy that could be easily digestible and provide some rollicking Saturday matinee entertainment. Outside of the big and dumb part, it fails on almost every other level. Hire Paul Walker, and that'll happen.